These five institutions — the Professional Recyclers of Pennsylvania (PROP), the Pennsylvania Recycling Markets Center (RMC), Keep Pennsylvania Beautiful (KPB), the Electronics Recycling Association of Pennsylvania (ERAP), and the Keystone Chapter of the Solid Waste Association of North America (SWANA) — were signatories of a 2016 letter to the Pennsylvania General Assembly outlining a series of concerns about both the Covered Device Recycling Act (CDRA), Act 108 of 2010, and an attempted fix, House Bill 1900 of 2015. The CDRA outlaws disposal of televisions and other e-waste in landfills. It's a laudable effort to divert lead and other EPA-designated hazardous waste materials into the recycling stream. But the CDRA does not include provisions for the creation of sufficient infrastructure to support e-waste recycling, and the signatories of the 2016 letter say it has ultimately done more harm than good. The problems in the CDRA are manifold, say local e-waste recyclers. Many Pennsylvanians simply have nowhere to dispose of their old electronics. The Pennsylvania Department of Environmental Protection lists more than 70 drop-off locations and recycling events for e-waste, but also notes that "not all locations may accept all items, such as TVs" and that "most municipal programs have residency requirements." There also aren't enough service providers to recycle the state's full load of e-waste. Ironically, the CDRA shrunk the number of private e-waste recyclers operating in Pennsylvania. The newly flooded market made e-waste recycling unprofitable without manufacturer support, which is not sufficiently mandated by current state law, say industry groups. Ned Eldridge was listed as president of the Electronics Recycling Association of Pennsylvania in 2016 (The organization's webpage is offline at the time of this publication). He summed up the CDRA's effect on the e-waste recycling market in a 2016 press release published by KPB. "CDRA inadvertently created an environment in which a once-growing, Pennsylvania electronics waste recycling industry nearly collapsed," Eldridge said. "This forced counties and recyclers across Pennsylvania to reduce or abandon their once-productive programs." The state legislature has tried to fix the CDRA's shortcomings. In the 2015-2016 session, the General Assembly introduced House Bill 1900 proposing an amendment to the CDRA that would require electronics manufacturers to manage recycling for "a quantity of covered devices equal to the manufacturer's market share by weight." Recycling advocates object, pointing out that electronic devices weigh less and less with each passing year. As manufacturer recycling bills drop with every ounce shaved off a device's weight, processing costs continue to rise. This explains why sales weight is not a fair measurement for determining manufacturer responsibility across its products' life cycles, say the five signatories of the 2016 letter. In addition to explaining the flaws in the CDRA and HB1900, that letter also listed 11 points the signatories would support in a CDRA replacement. The coalition is asking for a bill that — among other things — establishes clear manufacturer obligations across product life spans, establishes a State Default Plan ensuring a robust network of e-waste collection sites, and a competitive bidding for Default Plan services. It would also ask for consumers to share in administration costs with a small point-of-purchase fee on covered devices (the letter-writers recommend $0.30). On June 29, 2017, the Pennsylvania state legislature sent Senate Bill 800 to committee. This proposed legislation — which remains in committee at the time of this writing — would adopt some of the letter's suggestions. Most importantly, perhaps, it would unshackle manufacturer contributions to recycling efforts from the weight of sales. It would also require the creation of recycling centers equipped to collect electronics waste throughout the state. The next regular Pennsylvania State Senate session day takes place on Sept. 24, 2018. Recycling advocates in the state are hoping for a passing vote on SB800. If that happens, the future of electronics recycling laws in Pennsylvania could be a little brighter than it appears today. "Amendment of Covered Device Recycling Act (CDRA, Act 108 of 2010)." PropRecycles. Professional Recyclers of Pennsylvania, 21 June 2016. Web. 3 July 2018. Beveridge, Scott. 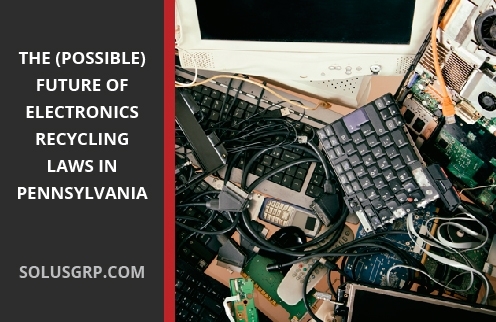 "Recycling electronics can be a challenge in Pennsylvania." Observer-Reporter. Observer-Reporter, 23 June 2018. Web. 3 July 2018. "Covered Device Recycling Act." DEP.PA. Pennsylvania Department of Environmental Protection, n.d. Web. 3 July 2018. "Recycling, Litter, & Waste Organizations Disapprove of Electronics Recycling Legislation and Proposed Amendment." KeepPABeautiful. Keep Pennsylvania Beautiful, 21 June 2016. Web. 3 July 2018. "Regular Session of 2015, House Bill 1900." LEGIS.STATE.PA. Pennsylvania General Assembly, 9 May 2016. Web. 3 July 2018. "Regular Session of 2017, Senate Bill No. 800." LEGIS.STATE.PA. Pennsylvania General Assembly, 29 June 2017. Web. 3 July 2018. "Waste Electronics Collection Programs." DEP.PA. Pennsylvania Department of Environmental Protection, n.d. Web. 3 July 2018.